A recipe from Monique van der Vloed in which Greensweet Extra Sweet and Greensweet liquid stevia have been processed. Irresistibly tasty! 100% easy to use and suitable for vegans. Preheat the oven to 180 degrees. Put a muffin tray ready. Cut out sheets of parchment square pieces. Grind the mulberries, pecans, Greensweet extra sweet, three kiwis, and the bananas into a creamy mass in the food processor. Cut two kiwis into very small pieces and put in a bowl. Add the mass from the food processor into the bowl and add the baking powder, stir well together. Always press a sheet of parchment paper into a mold and fill it with the batter. Bake the cupcakes in the middle of the oven until about 45 minutes, keep checking in the middle. Allow to cool. Make the chocolate: stir in the coconut oil the Greensweet liquid stevia drops and cocoa. Put this in the refrigerator for 5 minutes to solidify again. As soon as an edge has formed along the bowl, stir it again through the chocolate and let it rest further for about 4/5 minutes outside the fridge. Note: this can go quite fast, so stay with it. 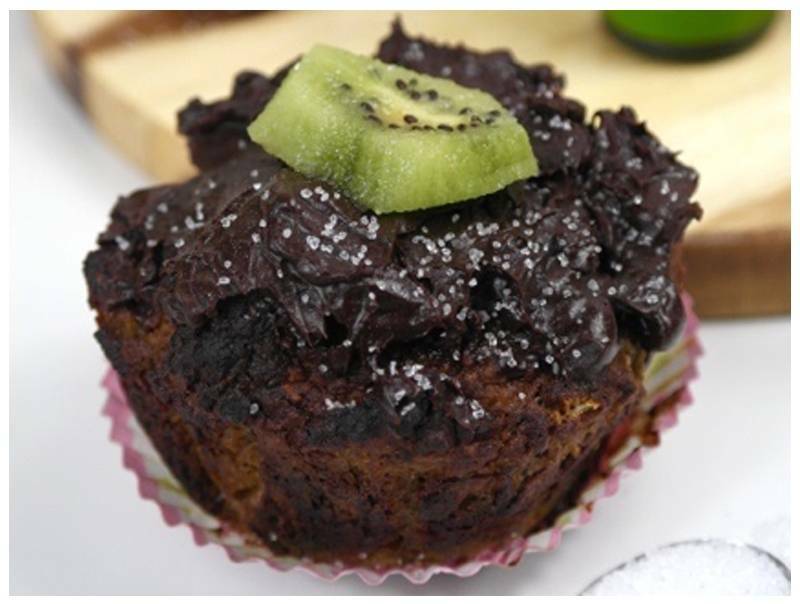 Once the chocolate has become a little thicker, rub it generously on the cupcakes. Put the cupcakes in nice paper shapes. Cut the last remaining kiwi into slices and press into the chocolate. If necessary, sprinkle with some stevia sugar. Let it be hard.